Typically, operators of the Voxel8 Developer’s Kit Printing Platform will design their parts to be printed using either Autodesk Project Wire, or with the Voxel8 SolidWorks add-in. However, there is a third option as well; which we describe abstractly in this support document. That 3rd option is creating the part in your own preferred featured 3D modeling application. This could be any mesh or parametric modeler as long as some key features are present in it that we will cover in this document (e.g. Fusion, Creo, Rhino, FreeCAD, etc). Project Wire is designed for very easy manipulation of basic electrical components and is based on 123dcircuits.io, combined with some elements of 123Design and TinkerCAD. From Project Wire (see Picture 001) you can print directly to the Voxel8 Developer’s Kit Printer, as there is a close integration between software and hardware. If you are interested in using Project Wire for your design activities, then you should check out the Autodesk Project Wire site. SolidWorks is a fully featured CAD application popular with many mechanical engineers and is considered an industry standard when designed parts. The Voxel8 SolidWorks add-in (see Picture 002) is an extension which gets loaded in with SolidWorks 2014 or later, and provides tools to create electrical trace within solid body objects you model. It can also import and embed components. If you are interested in using SolidWorks add-in, you should check out the Voxel8 SolidWorks add-in walkthrough. It is possible to use another CAD or 3D modeling application to design parts for the Voxel8 printer. This involves more work, since you must do everything from scratch, but it is possible (e.g. modeling trace widths, etc). The basic steps to working with the Voxel8 Printing Platform to design parts is explained below and can be adapted to more modern 3D modeling and CAD application frameworks. Essentially the Voxel8 Dashboard slicer engine only needs silver 3D geometry and plastic 3D geometry in order to generate a 3D printed part, such as embedded electronics. This means you just need to generate the mesh model of your 3D parts, as well as the 3D model of the trace that interacts with your parts you can use a 3rd party modeling tool. NOTE: For design guidelines with silver trace you should check out the Voxel8 Design Guidelines. For instance, say we have the model below (see Picture 003) that contains a thermoplastic body with embedded electronic components, and some basic trace connecting those components. The assembly shown in Picture 003 is a thermoplastic housing with the following embedded components: resistor, LED. In this document, we will step through the general design process of hooking up trace to electrical components within the 3D printed body. The LED embedded in the body will be lit by a connected 3V power supply. The positive and negative leads are shown in Picture 004. Picture 003: A simple mechatronic part in Wireframe mode. Picture 004: A simple mechatronic part with the positive and negative terminals exposed at the top for connecting a power supply (=~ 3V). NOTE: You don’t have to worry about applying a boolean subtract on cavities on parts, since the Voxel8 Dashboard already does this with its custom slicer. You only need to provide the geometry of the actual part you want to embed or place. The first step to generating a print for the Voxel8 printer is to determine the volumetric shape of the enclosure or 3D shape you want all your electronic or other parts (e.g. magnets, fasteners) to go in. NOTE: You can design parts in more of a 2D style as well, like a PCB. However, the real strength and opportunities in the Voxel8 Developer’s Kit is to print 3D electronics, not 2D equivalents. Normally, the body is made of thermoplastic material such as PLA and ABS. However, only a substance that provides good adhesion with the conductive silver ink is required. Currently we know that PLA works best for the first iteration of the Voxel8 Developer’s Kit printer. Picture 005: A 3D modeled cylinder used to embed 3D modeled electrical components (LED and Resistor here). The Voxel8 Developer’s Kit would be of little use without the integration of electrical components inside of the 3D printed bodies. To generate component part geometries such as resistors, capacitors, and other basic electrical components, you’ll need to either find a source to download a CAD model of a component, or construct a 3D model from scratch that approximates the dimensions of the part geometry that you want to include in a print. Picture 006: Resistor that has been modeled from scratch. Here is the shape of the LED to be put into the print. Picture 007: LED that has been modeled from scratch. Picture 008: The LED and resistor for size comparison. After generating the component geometries, it’s time to place them within your body (i.e. our cylindrical model). Typically this means positioning them either subsurface within a body, or embedded within the surface, but left exposed for easy access (e.g. a switch for instance). The example in this document is an LED embedded into your thermoplastic body. This would be placed either subsurface or less than 5 layers of plastic so that the LED light can show through the printed body. NOTE: CAD applications that support part “mating” like SolidWorks, or a method of aligning multiple parts together accurately is recommended. Making registration marks within a printed body to line up components is a good idea as well. Positioning parts can be accomplished by setting a snap to grid layout feature (if present in your CAD) and then moving them around. The more controls a modeling has for position, the better (e.g. snap to grid, etc). Picture 009 shows the resistor and LED before being placed in the sample body. Picture 009: The resistor and LED components are ready to be positioned. Picture 010: Resistor has been placed on top of solid body disc. LED is currently selected for placement on top of the solid body volumetric disc. Typically a line segment drawing tool is best for generating the traces for your Voxel8 printed part. However, because you are not using the SolidWorks add-in or Project Wire, you will need to take care of the trace width and height yourself within the modeler application. Applications with allow for cylindrical primitives as well as volumetric lines will work (e.g. a long rectangular structure). 250 micron is the minimum width of the trace, so you will need to have 0.25mm for the width, and a height value of approximately 0.19mm (i.e. approximately 190 microns). 500 micron width is typical trace width for the Voxel8 Developer's Kit Printer. Applications that allow you to draw using a line tool and then extrude to a volumetric line would be ideal. CAD applications which allow for connecting surfaces or points easily is recommended to mate one side of a trace geometry to a component or another piece of trace (see Picture 012). Picture 013 and 014 show the top down view of the first connection from the LED geometry to the resistor geometry. Picture 015 shows the trace hookup to the components before embedding them into the body. Picture 012: Adjusting the width of the simulated trace in a generic CAD application. Picture 013: Top Down View - first trace has been created between a mock LED and resistor. Picture 014: Isometric View - first trace geometry has been placed between the LED and resistor. Picture 015: Isometric Profile - Trace before it is embedded into the part. The next step would be to generate the rest of the trace and finish making the circuit between the resistor and LED with the positive and negative power leads protruding through the volumetric body (see Picture 016). Picture 016: The LED now has trace on both its positive and negative end points. Now, all the trace has been constructed but has not embedded in the 3D printed body portion of the example (see Picture 017). Picture 017: Isometric Profile - Trace has been selected. Picture 018: Side Profile - Trace before it is embedded into the part. NOTE: trace needs to have a minimum width of 250 micron and height of approximately 190 micron (0.007"/0.19mm). Now it is time to shift the trace and components down into the 3D printed part. Typically this can be done via grouping model objects and then adjusting the z height of the part. In this example we place the trace and components to the bottom of the 3D printed part (see Picture 018). Picture 019 shows the embedded circuitry from a top down view. Picture 019: The electrical traces are selected within the wireframe of the thermoplastic disc body. Picture 020: Top View of the electrical trace within the thermoplastic disc. Exporting STL files from the 3rd party Modeler is the next step. Most CAD and 3D modelers handle STL export well. However, if your package does not handle this you may have to find a way to convert all of these geometries into .STL file format for the Voxel8 Dashboard to properly be able to identity and slice the various parts. The insulating plastic, conductive silver, and components much each be exported as individual STL files with a common XYZ origin. Picture 021: Exporting the pieces of the project from the Modeling application. When you are ready to print your designed part you will upload all the .STL files into the Voxel8 Dashboard, first (see Picture 021). Picture 022: Uploading .STL files to the Voxel8 Dashboard. After uploading each individual .STL file for the components and silver trace, the Voxel8 Dashboard allows you to assign each one what is silver, component, and body. Below is the silver trace and components assigned within the Dashboard WITHOUT the plastic body (see Picture 022). Picture 023: The example loaded into Voxel Dashboard with components, and silver are assigned, but not plastic body (yet). Now the plastic body .STL is uploaded, and the example is ready to be analyzed (see Picture 024). Picture 024: The example trace and components separated inside of Voxel 8 Dashboard. Once you have exported .STL files for body, components, and trace it is time to upload all of those files into the Voxel8 Dashboard to assign their respective materials, and to slice them for printing on the Developer’s Kit. After slicing the files will be in .gcode format which is what the Voxel8 Printing Platform expects and needs to print. Picture 026: Slicing the project in Voxel8 Dashboard. Before printing, it’s a good idea to verify that the generated parts from the Voxel8 Dashboard have been successful. Currently this is achieved by a 3rd party g-code visualizer. Repetier Host is recommended, but you can substitute any good g-code visualizer that shows path moves during the time it prints within simulation. Things to look out for during verification are correct geometries for components, body, and trace, as well as any errors that may be caused in the travel paths of the extruder head (see Picture 025). After slicing your part, you’ll want to load it onto the Voxel8 Developer’s Kit Printer and print it. If you haven’t already gone through the Visual Start Guide, then now would be a great time to do so. 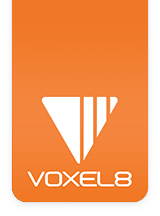 This steps you through the printing process of the Voxel8 Developer’s Kit. In this document, we have discussed how to create a part using a 3rd party 3D modeling tool. Now that you understand the workflow for creating parts on the Voxel8 Developer’s Kit platform, you can now check out the SolidWorks walkthroughs, or Autodesk Project Wire documentation walkthroughs on the support site. Additionally, tips, tricks, and best practices can be found here. If you have not checked out the design guidelines for printing silver, then you might want to look at those to help guide how on what to do/not do outside of the prepackaged Voxel8 SolidWorks add-in and Autodesk Project Wire tooling.